Everybody makes mistakes. 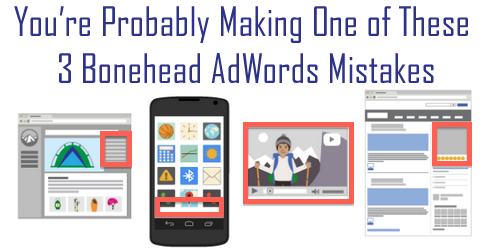 Having audited hundreds of AdWords accounts, I’ve seen plenty of PPC blunders. Blindly accepting Search Query suggestions: we all know that examining search queries to find potential positive and negative keywords is a “best practice.” It’s easy to generate a Search Query report – when viewing keywords, just look under the Details drop-down. AdWords “helps” you turn search terms into negative keywords – you just select the search terms and click on the “Add as a negative keywords” button. Side note: frequently it makes better sense to apply the negative keywords at the Campaign level rather than at the Ad Group level. If that’s the case, make sure to change that option as shown in the second screen shot. Using negative keywords in Google Display Network campaigns: It’s not unusual for advertisers to create keyword-targeted Display campaigns by duplicating Search campaigns or ad groups and just changing the network targeting. These are easy to spot because ad groups usually consist of long positive and negative keyword lists. I’ve also seen plenty of Display campaigns with different targeting – topic, placement, and even remarketing – to which negative keywords have been added – usually the same negative keywords that have been used in the advertiser’s Search campaigns. Why is this a mistake? Because negative keywords should almost never be used in Display campaigns. The reason is simple: For each negative keyword, the advertiser is telling AdWords, “Don’t display my ad on any pages that contain this word.” Many Display Network pages might be perfectly relevant to your company or product – while containing words in your negative keyword list. Have you been frustrated when a Display Network ad group fails to “get traction” – accumulating a surprisingly small number of impressions and clicks? Check to see whether your campaigns or ad groups contain negative keywords. Usually it makes sense to simply delete (er… “remove”) ‘em all. 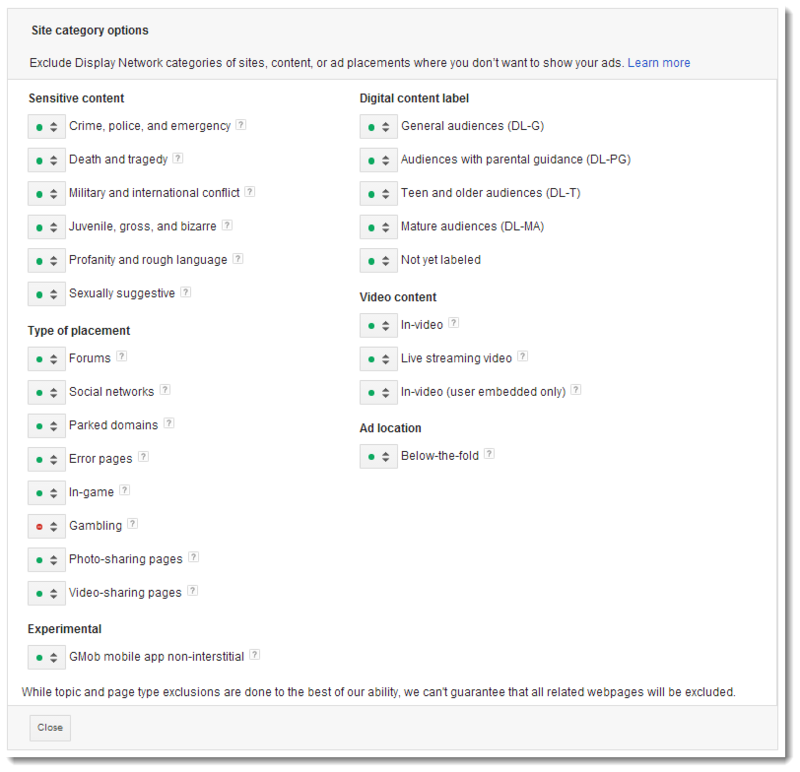 Displaying ads on shaky GDN sites: Unless you check your Automatic Placement reports verrry carefully, you might not realize your Google Display Network ads are often appearing on sites with relatively “undesireable” content. Do you want your ads appearing on sites with content that’s sexually suggestive, or “juvenile, gross and bizarre?” Do you think your ads will perform well on parked domains and error pages? Very few GDN campaigns I’ve seen take advantage of a simple mechanism for keeping ads off whole categories of potentially-undesirable sites: Site Category Exclusion. The Gambling category is excluded by default, but I suggest you exclude most of the categories in the first section, along with Parked Domains and Error Pages. Bonus: exclude “Below-the-fold” and your ads will always appear near the top of the screen! So that’s it: the three bonehead mistakes I see most frequently. Are you such a PPC stud or stud-ette that you already knew about them all? Email me at david@fmbmedia.com and I’ll send you a free copy of my book. David Szetela is one of the world's best-known experts in online advertising, and CEO of search and social advertising agency FMB Media. A former Apple Computer executive and serial entrepreneur, David's career has been dedicated to helping companies of all sizes maximize revenue and profit. His two books on PPC advertising have helped train a generation of marketers. His articles on PPC advertising have been published in The SEM Post, MediaPost, Search Engine Watch, Search Engine Land and MarketingSherpa. He hosts a weekly radio show called PPC Rockstars, produced by Webmasterradio.fm and distributed by iTunes and other major outlets. David is a frequent speaker at Search and Advertising industry events like Search Engine Strategies, SMX, Pubcon and ad:tech. He was recently voted one of the top 25 PPC Experts by PPC Hero for the second year in a row.